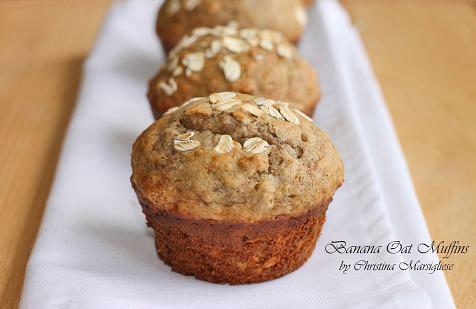 Scientifically Sweet: Banana Oat Muffins in 25 minutes flat! 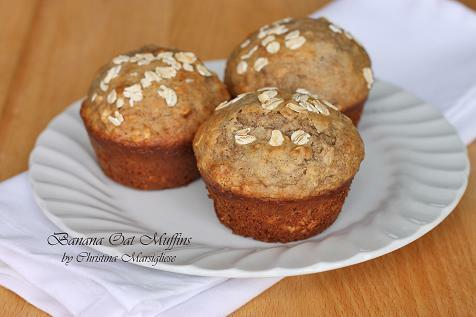 Banana Oat Muffins in 25 minutes flat! My place is a mess. I've completely taken over the coffee table as my "studio" and you can barely see the surface of my desk. The coffee table has become a haven for cutting boards, bright-coloured dish towels, linens, fancy plates, forks, crumbs, spoons, more crumbs.... Good luck putting your feet up on it (sorry, babe!). Next to it stands my SLR mounted on it's tripod....it's practically taken over the place yet refuses to pay rent! What a mooch. And then there's my giant white bristol board that I use to reflect light when necessary on these grey winter days. It's all banged up now...full of tears and creases. Who knew I'd be spending at least 2 hours of my day, every day, taking photographs of a single Chocolate Velvet Brownie, Praline Ricotta Crostata or Cream Cheese-Filled Carrot Muffin.....weird. Seriously. What do you even do with 150 images of one item! With all of this nonsense going on, its essential that I have a fast breakfast recipe to get me going. Ever have that one last banana left in the fruit bowl that nobody wants to eat because...well it's last?! Poor thing. 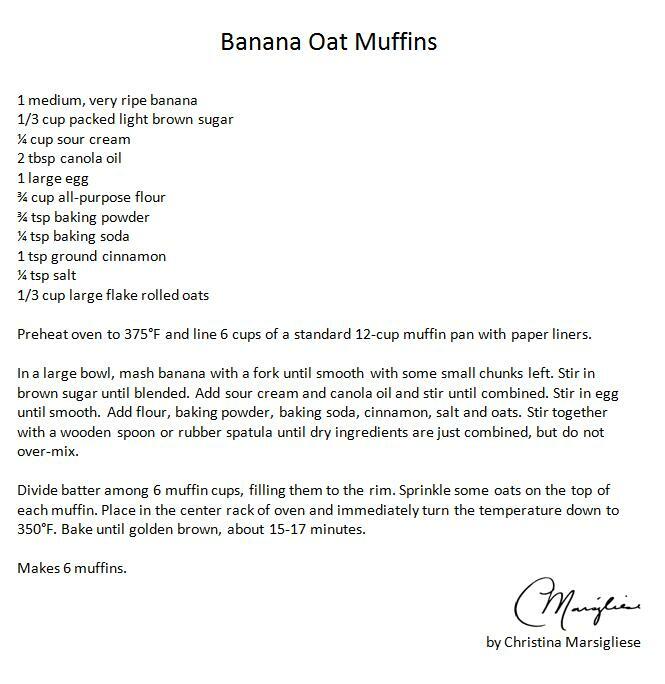 Make 6 big moist Banana Oat Muffins and use only 2 tablespoons of oil and a fork! Yes, it's that easy. This recipe comes together in 10 minutes and takes a mere 15-17 minutes to bake. So, it's totally doable even on the busiest of mornings and it only makes 6 so you don't have to worry about them staling before you actually have a chance to eat them all. I made these on Sunday for my Lova (husband) to take to work with him. We're both the type that likes to eat breakfast at work...not at home. I'd rather use those extra 10 minutes sleeping please. One important thing you need to know about muffins is that they're easy. It's called a quick bread for a reason I guess. Since muffin technique only requires you to stir together wet ingredients, then stir together dry ingredients, then mix them both together.....you need to make sure you have a light hand. There's no fancy aerating steps or creaming stages. Just mix this, mix that, then mix both. So when it comes to the last step (ie. mixing the dry into the wet), make sure you stir gently and do not over-mix. As soon as you see most of the dry ingredients gone, stop stirring! Any more and you might start developing large glutinous protein networks that will give your muffins the texture of bread rather than....well, a muffin! Other than that this could be a very happy day for you. Banana, oats and cinnamon for ever. i have always heard not to over-stir muffins but never knew exactly why. good to know! i've got yours saved to my google reader so i can come back and peruse your enticing content later. i now make these muffins around once a week! my family loves them and they are so easy to make! thanks for the recipe! @krmorris27 Yes! I love this. Lovely muffins and the "fastness" of making them is a big plus for me! I'm going to try these very soon! Maybe this weekend if I have the time! But I know my crew will love them! I like the ingredients!! I just made these and they are delicious and moist, I love how little fat they have in them. I used plain yogurt instead of sour cream and it worked well. Thanks!